The World Health Organization Director General commend the Senate President of Nigeria, Dr. Bukola Saraki, has received an international commendation for a recent commitment he made - The commendation was from the Director General of the World Health Organization (WHO), Dr. Tedros Adhanom Ghebreyesus. Dr. Ghebreyesus is impressed with Saraki's initiative to provide basic primary healthcare services across Nigeria The Director General of the WHO, Dr. Tedros Adhanom Ghebreyesus, has commended the Senate President, Dr. Bukola Saraki, on his commitment towards ensuring that Nigeria’s primary healthcare system is strengthened by the inclusion of one per cent of the country’s Consolidated Revenue Fund (CRF) is used to provide basic primary healthcare services across the nation. Dr. Ghebreyesus, in a tweet on his personal Twitter handle, @DrTedros, also stated that political will is needed to provide universal healthcare coverage. Earlier this week, Saraki, in a keynote address delivered at the 58th Annual General & Scientific Conference of the Nigeria Medical Association (NMA), stated that universal healthcare is a promise that he and his colleagues in the National Assembly have made to Nigerians, and it was one that they were also determined to keep. “As I intimated when the delegation led by the NMA president and the executive called on me at my office, and as I reiterate now, primary and universal health care provision is a key legislative agenda for the 8th Senate under my leadership. It is a promise that we have made to Nigerians, and one that we are determined to keep,” Saraki said. 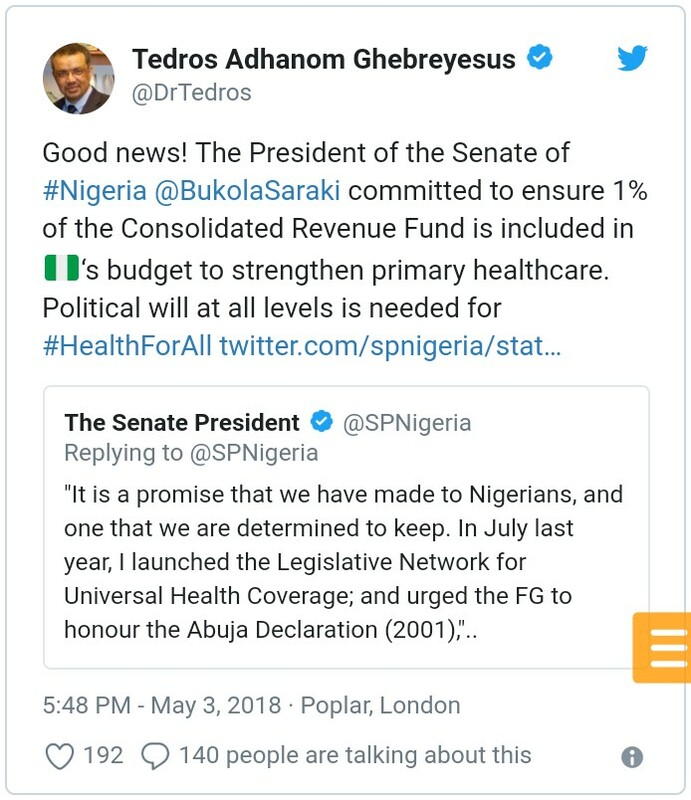 In June 2017, the Senate President launched the Legislative Network for Universal Health Coverage and urged the Federal Government to honour the Abuja Declaration of 2001, while also calling for the full implementation of the National Health Act of 2014, which he helped to formulate in the 7th Senate (2011 to 2015). “There is no better place than here today, to announce that the issue of funding will be attended to in our budgetary review of the 2018 Appropriations Bill. The Senate has, with the cooperation of the House of Representatives, resolved to mandate our Committees on Appropriations to ensure that the pledge to set aside 1 per cent of the Consolidated Revenue Fund for the Basic Health Care Provision Fund (BHCPF) is met,” Saraki said at the event. 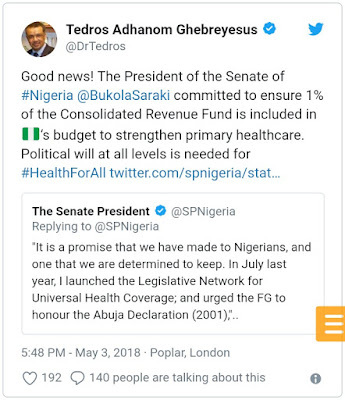 With this move by the Senate President, Nigeria’s health expenditure as a proportion of government’s general expenditure which currently stands at just 4% is expected to increase significantly, while at the same time reducing the cost of out-of-pocket expenditure of Nigerians for healthcare, which is currently pegged at 73%. Saraki, 55, qualified and practiced as a medical doctor at Rush Green Hospital in London, United Kingdom, before his foray into banking, and later politics. His wife, Toyin Saraki, is the Founder/President of Wellbeing Foundation, and also a special advisor to the Independent Advisory Group (IAG) of the WHO Regional Office for Africa.